NEWS: Inner City Centre Parcs? The City Academy in Bristol seems to be constantly in the news for their wonderful exam results, top class facilities, and for opposing heavy vehicles driving past their school - and all for the benefit of local children. 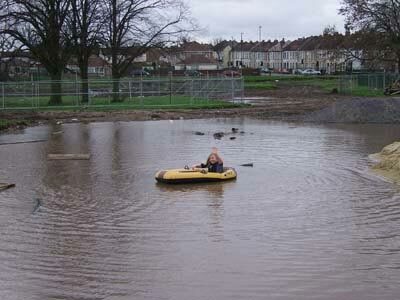 Now the Academy has gone even further, with a plan to bring their own version of Center Parcs to the inner city. What used to be Packers Playing Field in Whitehall now includes two swimming facilities, which can double up as boating lakes, a small beach and artificial rock pools. For the more adventurous a vast range of lumps, bumps and muddy sections are available for the mountain bikers and fell runners in the local community. Until August of last year, this site was a popular well-used open field in an area, which is extremely lacking in green space. Obviously this is not really their plan (because we don’t know what their plans are, athletics, student Olympics, a swimming pool?) 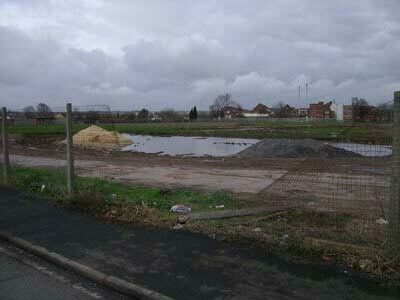 but the construction work on the site which began in August 2006, stopped at the end of November 2006 and the site was left flooded (see photos). So in all seriousness what is going on? A recent visit to the site highlighted the following: This once thriving open space, which (in spite of Academy propaganda claims) was used respectfully by the vast majority of local people, now looks empty, derelict and is totally useless to everyone - except the local seagull population. It is still an easily accessible site, you can just walk through an opening in the fence, and it contains two large pools of water, which are large enough to float a dingy in, and so are therefore also deep enough to drown a child. The site is known to be contaminated land and contains twice the 'safe' levels of arsenic, hydrocarbons and who knows what else within the soil. We are marching quickly on towards spring and the lighter nights, and this once open green space is not only lost to the local community, but also presents a significant Health and Safety hazard to local children. Is this really of benefit to local children?